The derivation of the diffusion equation depends on Fick’s law, which states that solute diffuses (neutron current) from high concentration (high flux) to low concentration. As can be seen we have to investigate the relationship between the flux (φ) and the current (J). This relationship between the flux (φ) and the current (J) is identical in form to a law (the Fick’s law) used in the study of physical diffusion in liquids and gases. If the concentration of a solute in one region is greater than in another of a solution, the solute diffuses from the region of higher concentration to the region of lower concentration, with a magnitude that is proportional to the concentration gradient. φ (for ideal mixtures) is the concentration. The use of this law in nuclear reactor theory leads to the diffusion approximation. 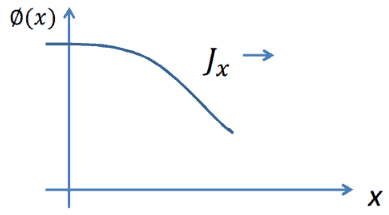 The current density vector J is proportional to the negative of the gradient of the neutron flux. The proportionality constant is called the diffusion coefficient and is denoted by the symbol D.
J is the neutron current density (neutrons.cm-2.s-1) along x-direction, the net flow of neutrons that pass per unit of time through a unit area perpendicular to the x-direction. φ is the neutron flux, which is the number of neutrons crossing through some arbitrary cross-sectional unit area in all directions per unit time. 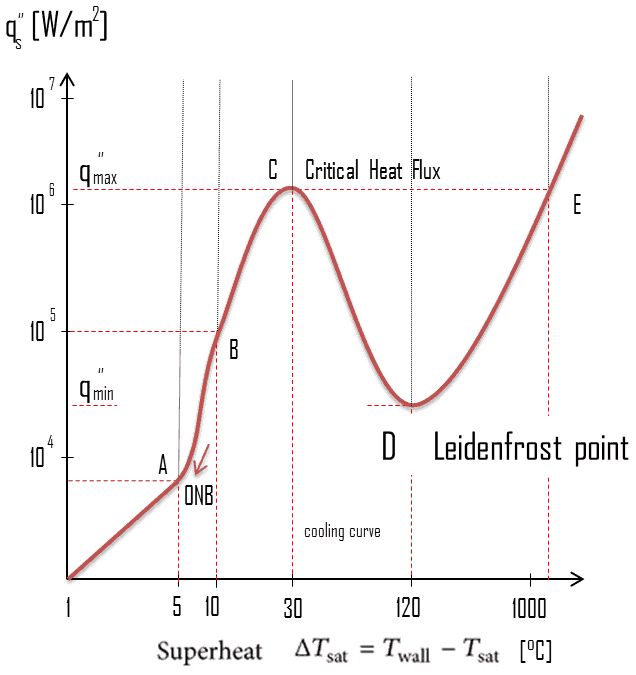 where J denotes the diffusion flux vector. Note that the gradient operator turns the neutron flux, which is a scalar quantity into the neutron current, which is a vector quantity. The physical interpretation is similar to fluxes of gases. The neutrons exhibit a net flow in the direction of least density. This is a natural consequence of greater collision densities at positions of greater neutron densities. Consider neutrons passing through the plane at x=0 from left to right as the result of collisions to the left of the plane. Since the concentration of neutrons and the flux is larger for negative values of x, there are more collisions per cubic centimeter on the left. Therefore more neutrons are scattered from left to right, then the other way around. Thus the neutrons naturally diffuse toward the right. 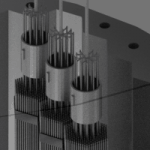 In reactor physics, the neutron flux is often used, because it expresses the total path length covered by all neutrons. 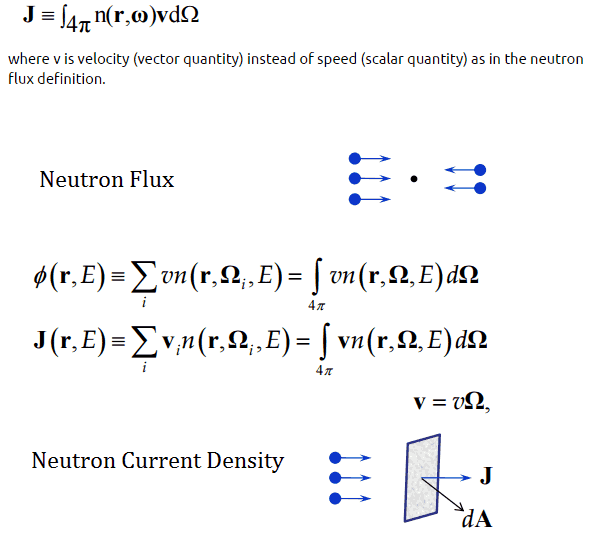 The total distance these neutrons can travel each second is determined by their velocity and therefore the neutron flux density value is calculated as the neutron density (n) multiplied by neutron velocity (v). 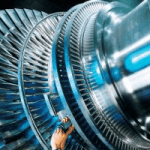 The neutron flux, which is the number of neutrons crossing through some arbitrary cross-sectional unit area in all directions per unit time, is a scalar quantity. Therefore it is also known as the scalar flux. The expression Ф(E).dE is the total distance traveled during one second by all neutrons with energies between E and dE located in 1 cm3. 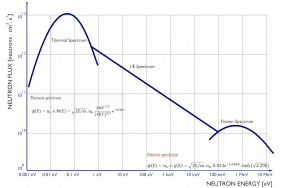 The neutron flux, φ, does not characterize the flow of neutrons. There may be no flow of neutrons, yet many interactions may occur (I = Σ.φ). The neutrons move in a random directions and hence may not flow. Therefore the neutron flux φ is more closely related to densities. Neutrons will exhibit a net flow when there are spatial differences in their density. Hence we can have a flux of neutron flux! This flux of neutron flux is called the neutron current density. We have to distinguish between the neutron flux and the neutron current density. Although both physical quantities have the same units, namely, neutrons.cm-2.s-1, their physical interpretations are different. 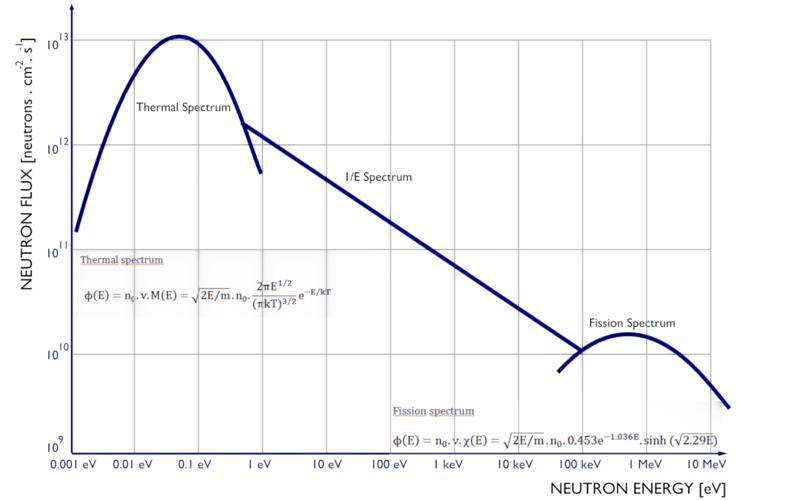 In contrast to the neutron flux, the neutron intensity is the number of neutrons crossing through some arbitrary cross-sectional unit area in a single direction per unit time (a surface is perpendicular to the direction of the beam). 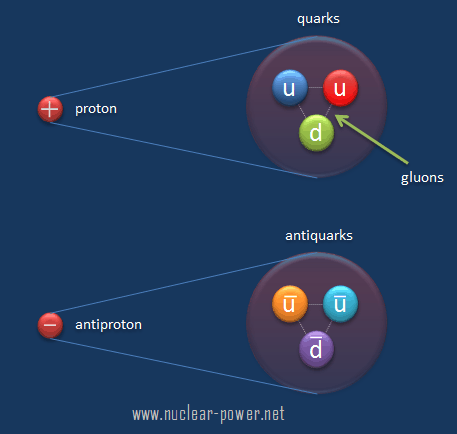 The neutron current density is a vector quantity. 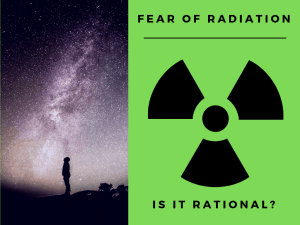 A typical thermal reactor contains about 100 tons of uranium with an average enrichment of 2% (do not confuse it with the enrichment of the fresh fuel). 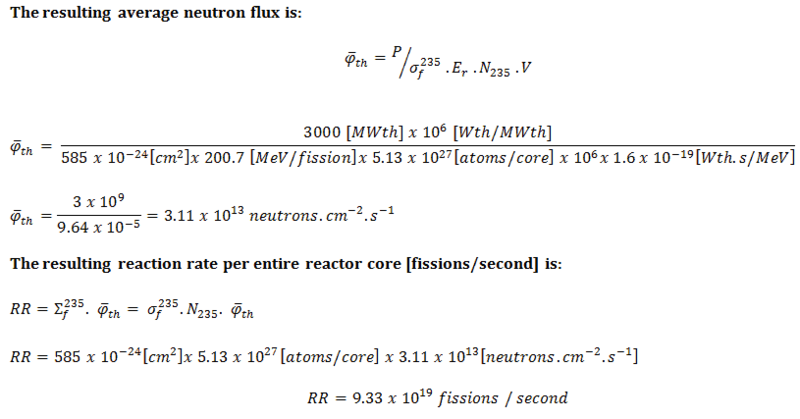 If the reactor power is 3000MWth, determine the reaction rate and the average core thermal flux. 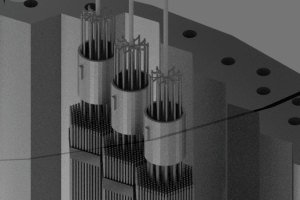 The amount of fissile 235U per the volume of the reactor core. Infinite medium. This assumption is necessary to allow integration over all space but flux contributions are negligible beyond a few mean free paths (about three mean free paths) from boundaries of the diffusive medium. Sources or sinks. Derivation of Fick’s law assumes that the contribution to the flux is mostly from elastic scattering reactions. Source neutrons contribute to the flux if they are more than a few mean free paths from a source. Uniform medium. Derivation of Fick’s law assumes that a uniform medium was used. 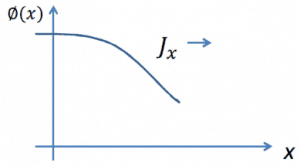 There are different scattering properties at the boundary (interface) between two media. Isotropic scattering. 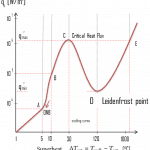 Isotropic scattering occurs at low energies, but is not true in general. Presence of anisotropic scattering can be corrected by modification of the diffusion coefficient (based on transport theory). Time – independent flux. Derivation of Fick’s law assumes that the neutron flux is independent of time. 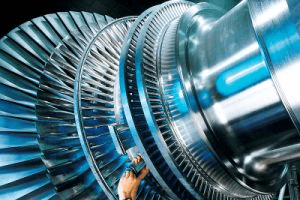 To some extent, these limitations are valid in every practical reactor. Nevertheless Fick’s law gives a reasonable approximation. For more detailed calculations, higher order methods are available.